Choosing The Best Bench Vise! When it comes to upgrading your workbench, there is absolutely no more versatile or valuable tool than the bench vise. In simple terms, the wide array of capabilities that a bench vise affords you means that you will be able to complete more projects faster with fewer headaches. What makes a bench vise so valuable? The answer is simple. First, due to the time and money saved by using a good bench vise, it’s one of the tools that pays for itself most quickly. Second, a bench vise can double as a variety of other tools such as wrenches, pliers, anvils, arbor presses, sanding blocks, and C-clamps. Finally (and most importantly), a bench vise can be used like an extra set of hands in a pinch. Whether you are a handyman, handywoman, or just plain not handy, a bench vise is going to make your life easier. Now if you are a seasoned veteran when it comes to working around the house (or an aspiring one who is just short on time presently), we might be able to save you some time. If you are already familiar with bench vises and are just looking for a quick recommendation from an expert, feel free to take a look at the quick reference chart below or skip ahead down the page to read reviews of some of our high quality favorites. If not, keep reading! A bench vise (sometimes spelled vice) is a device that is used to keep an object in place securely. It typically consists of a pair of jaws that run parallel to each other. One jaw is typically fixed, where the other is adjustable via a screw and lever combination. The screw and lever are turned one direction to tighten the jaws and the other to loosen the jaws. In other words, a vise gives you mechanical advantage when it comes to grip strength. Bench vises are used across a wide array of industries to perform a wide variety of tasks. While some vises are specifically designed for individual tasks such as woodworking or metal fabrication, a bench vise typically refers to a general purpose vise that can serve in many capacities. Why Would You Use a Bench Vise? The most likely reason you are going to use a bench vise is for grip between the jaws. Often times you want to hold something still so you can perform precision work, and other times you simply need more grip strength than your hands can provide. Grip can take many forms. Perhaps you need to hold a piece of machined metal still so you can use a file with two hands to deburr the edges. Or, you might need to apply pressure to two plastic parts to keep them in place for a long while after bonding them with adhesive glue to make sure the adhesive cures properly. It could even be that you need to hold a piece of wood still so that you can accurately locate small holes with a drill. The list of examples could go on for days, but the gist is that a bench vise can be used to hold things in place. 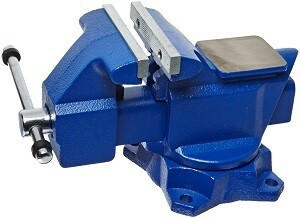 Sometimes a bench vise can be used to apply compression force, which is closely related to grip. An example of this type of use is when you need to apply necessary force to lightly press fit a pin into a slightly undersized hole. Another time you may need to apply force is when you need to straighten a warped piece of metal. While this use is less common than grip, it still comes up quite a bit. Another interesting use for most bench vises is using them as a work surface. Many bench vises have a built in anvil, which is a flat surface designed to withstand striking force. Some examples of when you may use your vise in this fashion are when you are bending metal or stamping parts. What Makes A Good Bench Vise? Features are arguably the most important aspect of a bench vise. We have listed some of the more common features below to give you an idea of what to look out for. The two most common types of mounting interfaces are bolt-on type and clamp type. As the name implies, the bolt-on type bolts directly to your work bench through a flange on the vise. They typically require 4 bolts to secure the vise in place. This type of mounting interface is considered to be heavy duty, and is an absolute must if you intend to use your vise to apply high clamping force. These can be a little more difficult to mount, as you may need to modify your work bench by drilling some holes to accommodate the tool. On the other hand, clamp type bench vises are much simpler to install, but much less secure. It is for this reason that we only recommend the clamp type vise for lighter duty applications where you don’t intend to apply high clamp force with your vise. As you would likely guess, the tool clamps to your work bench in much the same fashion as a C-clamp. There are some other niche types of bench vise interfaces such as vacuum type and electro-magnetic type, but these aren’t that useful for most handyfolk unless you have a particularly specialized application where you might need such functionality. The ability for the bench vise to swivel can add convenience to a lot of projects. Swivel comes in a variety of flavors. The most common is swivel around the base. This means that you can turn the top of the vise about a vertical axis that extends upwards from your work bench. In other words, you can make the main jaws sit parallel to any of the 4 walls in your garage. Another type of swivel is x-axis swivel, which means you can rotate the jaws from a horizontal position to a vertical position. In other words, you can swivel your vise such that the top of your jaws face the ceiling, a wall, or turn them upside down to face the floor in your garage. The above types of swivel are not mutually exclusive. Many high quality vises have both types. The jaw style and jaw length are very important. Much like tires are the first point of contact between your car and the road, the jaws of a bench vise are the first point of contact between your work bench and your work piece. That said, your jaws must adapt well to what you are working on. The two most common types of jaws are parallel jaws (also known as flat jaws) and V-jaws. Flat jaws are typically used for holding items with flat surfaces (think about the shape of a Lego), and V-jaws are typically used for securing round items (think something shaped like a pencil). Note that pipe jaws and V-jaws are very similar so we don’t differentiate them for purposes of this article. Many quality bench vises have both types of jaws, so you can get the best of both worlds. It should be noted that cost will typically go up if you want both. An additional consideration is the fact that some jaw inserts are replaceable. This means that as they wear, you can unscrew them and remove them. You can also find some jacks with swappable jaws that each have different surfaces (aka amount of “bite”) on them. A fun trivia fact is that the most common type of jaw inserts today are called T-style inserts. Many bench vises, but certainly not all, have a flat work surface called an anvil. This is a nice to have feature that provides a durable, flat surface that you can strike against. This is nice because it saves your work bench from some abuse. If you start trying to hammer on something using your work bench as a back stop, you are bound to chew it up or otherwise mar its surface. The anvil on a vise is designed to handle this type of use, so you don’t have to worry about hurting your other tools. Most bench vises use a special kind of screw, often referred to as a jack screw or lead screw. The thread shape on this type of screw is typically square, which is different than a standard screw. These types of screws have a high load carrying capacity and are relatively smooth. While it’s good engineering knowledge, you don’t need to worry too much about the details of the screws themselves. Pretty much any bench vise screw will be designed to withstand more than enough force to hold parts in place. Another more relevant detail is whether or not the screw is covered. An uncovered screw, meaning one where you can see the threads with your eyes, is going to attract dirt and grime. As this builds up, the screw will turn less freely due to added friction. Covering the screw makes it internal to the vise and prevents this issue. Another big differentiator worth paying attention to is the handle used to operate the screw. This is often a weak point on bench vises, and it is not uncommon to see them bend. Good stout handles, both on the main jack screw and the swivel locking screw are crucial when selecting a good vise. In short, you will want to make sure the handle is long enough to give you adequate leverage, and strong enough not to bend or break when you do. While this may be self evident, we can’t stress enough that there are vast differences in quality when it comes to vises. Just like any other tool, bench vises are made all over the world using a wide array of fabrication techniques. Most often vises are cast iron with machined steel jaws. Less commonly, you will run into aluminum bodied vises, however these tend to be flexy as aluminum isn’t really a suitable material to make a vise with. In reality, it’s very difficult to look at a vise and tell its exact material composition, the quality of the alloy, and the quality of the design. The best way is to learn from the experiences of others who have used the tool before you, and this is exactly why we wrote this guide! Note that the country of origin doesn’t necessarily signify the level of quality. USA made vises tend to have high quality, but there are also some that don’t. European and Japanese vises can also be very nice. There are some respectable vises made in China and other parts of the world, although you will tend to find them less frequently. Value is really just a measure of price versus the combination of quality and features. That said, a more expensive vise can sometimes have higher value if it offers more per dollar than a cheaper vise. There is no doubt that quality tools should last a lifetime, so in theory you should only have to buy a bench vise once. Because of this, sometimes it pays to spend a few bucks more to get a higher quality vise because the long term value will be more likely to pay off if you know you can rely on the tool forever instead of having to potentially replace it down the road. Bench vises are relatively simple tools, and accordingly they require a relatively small amount of maintenance. The most important aspect of maintenance is to keep the lead screw lubricated (click here for our lube recommendation). You don’t need to do it often and once a year or so is sufficient. If you have an exposed lead screw that tends to gunk up and needs frequent wiping, then every month or two is advisable. It’s also important to keep your vise clean. If you are going to spend money on a nice tool, spending 10 seconds after using it to wipe it down is well worth keeping it in good shape for the long run. You may use a solvent if you plan to re-lube, but otherwise a dry shop rag or paper towels should be sufficient. There are a few basic safety tips to keep in mind when using a bench vise. Remember, your bench vise was designed to be used in a specific fashion. Sometimes it’s tempting to use your vise in other ways, but this always carries some risk and is never recommended. 1) Avoid using “cheater bars” or extensions on the handle. This is the number one way to bend the handle. Similarly, don’t hang on the handle and use your body weight. You risk damaging your tool by bending or breaking the handle as well as risk injuring yourself. The handle was designed to be operated by hand. 2) Only use the vise to apply compressive force. Even the best bench vise will yield if you try to pull tension with it, as they are not designed to withstand forces in this direction. So now that you know the qualities that make up a great bench vise, it’s time for us to make some recommendations. It’s important to keep in mind that we have used many of these tools over the years, so this list comes as a result of a whole lot of experience using these devices. Without further adieu, the following are what we consider to be some of the best bench vises for the money. The Yost 445, which is part of Yost’s entry level Apprentice Series, is a superb all around vise and the one we most often recommend for a wide variety of applications. With 4.5″ jaws, this is nicely sized for most home garage use projects. As far as materials go, the main body of the vise is 30,000 psi cast grey iron whereas the jaws as well as the U-channel bar are steel. Some notable features include a locking swivel base with 180 degrees of range, replaceable jaws, and a decently sized anvil that provides plenty of space. The vise additionally has flat jaws as well as serrated pipe jaws which allow for secure grip of pipes up to 2 inches in diameter. We are also always a fan of covered screws, which this bench vise has. As far as build quality, it’s pretty darn good. Fit and finish are solid, and the casting work is pretty nice as well. The vise is built overseas, but this shouldn’t deter you as Yost has created a truly high quality and highly functional product. We chose the 445 because it is a vise that will do everything you need it to and nothing you won’t. In other words, it’s a no frills, direct to the point, well built, highly functional piece of equipment that won’t have you paying money for features you don’t need. If you are just looking for an inexpensive general use vise that won’t take up a ton of space and will get the job done every time, look no further! Tekton’s Swivel Bench Vise is our value pick for this guide. Tekton serves this model up in three flavors: 4″, 6″, and 8″. These vises have a bare bones feature set, but an extremely low price to match. The notable features include flat jaws, a swivel base, and a nicely sized anvil. The flat jaws are nicely serrated, providing ample texture to grip work pieces. In addition, they are replaceable so you can easily swap them out. The swivel base smoothly traverses across its 120 degree range. While 120 degrees doesn’t compete with high end vises, this is still a great feature for the price point. The anvil is large enough to provide ample room for working metal or whatever else you may throw at it. As far as quality, it is very high relative to the price point. You get a nicely cast 30,000 psi grey cast iron body powdercoated in black. You also get concealed screws which keep the grime out. The machined steel pieces on the vise are also pretty well done. At the end of the day, this vise isn’t the feature leader or the quality leader, but it is definitely the price leader. If you are an infrequent vise user who just wants bare bones but sturdy bench vise in your garage or shop, you can get into this vise for very cheap relative to the competition. 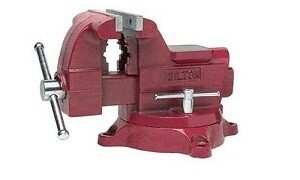 Wilton is a tool manufacturer with a longstanding history of making fantastic tools. They make a wide variety of vises including bench vises, machine vises for drills and presses, and other clamping tools. As such, it should come as no surprise that we consider the Wilton 11800 8″ vise to be the go to when you need heavy duty. As far as features go, the 11800 648HD is made with 30,000 psi grey iron and sports a rather rugged construction. The vise has replaceable 8″ steel jaws and a very nice anvil setup. It also has a set of pipe jaws that can handle pipe diameters up to 3 inches. It has a locking 180 degree swivel as well as a covered lead screw so it will require little to no maintenance long term. Screw actuation is smooth so there is little drama when clamping things down. Fit and finish are solid and we really dig the red amid the sea of blue and black from other manufacturers. The polished handles add a nice contrast and really set off the look. Aside from the looks, you should take note that this vise is big. It may not look like it on the screen, but it will take up considerable space on your work bench. If this vise is a bit too large for you, Wilton also makes some smaller variants of very similar vises that have the same features and high level of quality. Yep, we chose a second Yost vise to include in our top 5. Simply put, the Yost 750-DI is a beast. Of the vises reviewed in this article, it is the feature leader by a long shot. This vise is loaded with features. First off, the DI in the model number stands for ductile iron. Most vises are made from grey iron, but ductile iron is quite a bit stronger. There are three sets of machined steel 5″ jaws, including a set of parallel serrated jaws, a set of pipe jaws, and a set of V-jaws. These jaws are all replaceable, although it’s unlikely that you will ever need to. The vise swivels 360 degrees and tilts 360 degrees, which gives you a ton of different positions. The swivel has two locks. The lead screw is covered, which is key for keeping it dirt and grime free. It also has a generously sized anvil. The fit and finish are superb. The overall build quality is absolutely awesome. In general, the operation is smooth and everything works just as you’d expect. This vise is a nicely balanced in terms of size in that it won’t take up a ton of space but has enough heft and jaw length that it will be able to handle pretty much anything you ask of it. Considering the quality, there is no reason to hesitate about picking a Yost 750-DI up. It will serve you well pretty much forever trouble free. Now, when you think of bench vises, you likely think of rather large and heavy duty tools. For that reason, we were slightly hesitant to include the Panavise 301 in this lineup, but we just couldn’t leave it out. It’s an awesome tool that we absolutely love. First, let’s get one things straight. This is no heavy duty vise. This is a smaller vise with 2.5″ jaws that is designed for light duty and hobby work such as electronics, crafts, models, etc. This vise is all about detail work. 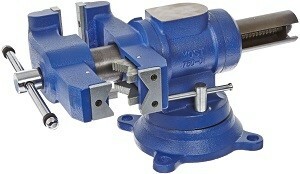 The main advantages to this vise are its positioning capability, ease of use, and size. 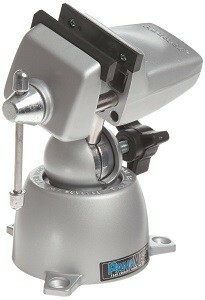 As far as positioning, this vise allows for 90 degrees of tilt, 360 degrees of turn, and 360 degrees of swivel. The many degrees of freedom that this vise can move through are accomplished by use of a modified ball and socket joint. The Panavise 301’s motion is extremely intuitive and the space it claims is absolutely minimal. There are also a bunch of different accessories including a wide-opening head and a low profile head that are available for use on the Panavise 301. It should also be noted that fit and finish are great! If you are looking for a light duty vise for small detail and hobby work, this is the one we recommend. While this won’t entirely replace the functionality of a heavy duty bench vise on your work bench, it definitely adds a lot of capability that a heavy duty vise won’t and as such, we highly recommend adding it to your arsenal! After reading this article, you hopefully have a pretty thorough understanding of what makes a great bench vise. That said, it’s important to remember that while we have picked some of our favorite vises, there are many great vises out there and we simply weren’t able to cover them all. If none of the examples we selected quite fit your style, have a look at some other great bench vises that might suit you better by clicking here. Thanks for reading and happy wrenching!